More than £1million will be invested in maintaining some of Portsmouth's historic sites. Portsmouth City Council will be spending the money on maintenance and upkeep of the sites. The Square Tower will receive £250,000 and £200,000 will be used to upgrade electrics at Southsea Castle. The Round Tower and Cumberland House Natural History Museum are also set to benefit. The funding is part of the council's capital budget, which invests in a range of infrastructure schemes throughout the city like buildings and facilities. I'm delighted we are able to make this commitment to some of the city's most impressive historic sites. Everyone in the city enjoys these fantastic buildings and places but people don't often realise the work that goes into making sure they look their best and are safe to use. This work will ensure we can all continue to enjoy these sites for years to come." A pub landlord from Kent has discovered he's been using an ancient piece of history as a candle holder for the last two years. Ian Goodban, from Deal, hadn't realised the urn, which he found on a beach, dated back to the Iron Age. Andrea Thomas has the story. An exhibition surrounding the history of Bournemouth is on display at Bournemouth library. The display, called 'Our Town' tells the story of the development of Bournemouth over the years dating back to the 1600s when the town was owned by the Cooper Dean estate. A selection of reproductions from the Cooper Dean archive will be showcased alongside work by pupils at St Peter's School who created their own proposals for future developments in the town centre. The exhibition will take place from July 31 until August 11. Today marks seventy-one years since a German bombing raid killed forty-one people in Reading, Berkshire. A memorial plaque has been unveiled during a special service at Town Hall Square in Reading to remember those who died. One of the four bombs hit a restaurant where at least twenty nine people lost their lives. 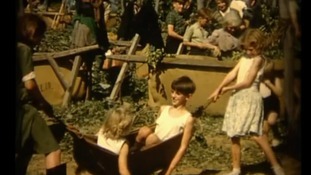 New footage that has remained unseen for fifty years has been released showing families on hop picking holidays in Kent. VIDEO: Artefacts recovered from the wreck of the Titanic are set to be sold for $189 million (£120m). The exhibition items range from delicate porcelain dishes and silver cutlery to a 17-ton section of the hull, including portholes, pulled from the Atlantic seabed where Titanic sank 100 years ago. An unnamed group have agreed to buy a collection of Titanic artefacts. The exhibition items, set to be sold for $189 million (£120m), range from delicate porcelain dishes and silver cutlery to a 17-ton section of the hull, pulled from the Atlantic seabed where the Titanic sank 100 years ago. Premier's shares jumped 18 percent on after it said in a regulatory filing it had signed a non-binding letter of intent to sell the artefacts to an unnamed group of individuals. A federal court ruled last year that a sale must ensure that the entire Titanic collection is kept together. "[The buyers] are obviously a group of significant means because they have to have the resources to display and care for the artifacts and they have to be suitable for court approvals."